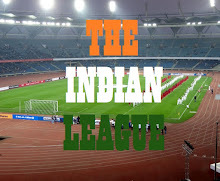 Chennai City have downed Mumbai FC 2-1 at the Jawaharlal Nehru stadium in a round eight clash of the Hero I-League. Goals from Dhanpal Ganesh (29′) and Charles de Souza (69′) helped the South Indian team to overcome Anderson’s opener (28′) for Mumbai FC. 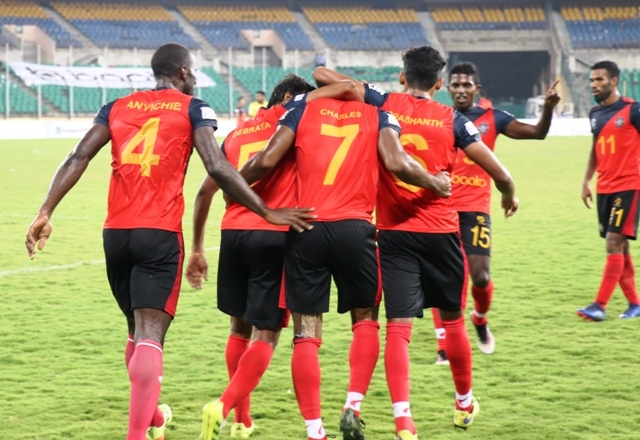 New Chennai City coach V Soundararajan opted to employ a 4-4-1-1 formation with Marcos Vinicius dropped and a first I-League start handed out to Tamil Nadu-based Michael Regin. Shahinlal was named between the sticks after Abhra Mondal and Karanjit Singh picked up injuries. Santhosh Kashyap, on the other hand, made as many as five changes to the side that lost to Minerva Punjab and drafted in new signings Mehrajuddin Wadoo and Djelaludin Sharityar straight into the starting XI. Victorino Fernandes, Nikhil Kadam and Munmun Lugun also made it back into the first XI. Both teams showed intent to win all three points in what was a crucial game as the action unfolded. There were several half-chances for both teams in the opening twenty minutes but nothing concrete. Both teams lost possession quite easily in midfield and seemed to be an equal battle until the game came alive in the 28th minute. Chennai City goalkeeper Shahinlal made a mess of a corner and failed to hold on to it, diverting it to Debabrata Roy who touched the ball with his hand while trying to control it. Referee Pranjal Banerjee immediately awarded a spot kick in favour of the visitors. Mumbai’s new signing Anderson da Silva, who had just replaced Hitesh Sharma, coolly slotted the ball home with what was his first touch of the game. But, before the euphoria died down, Chennai equalised. Charles de Souza’s shot from the edge of the box was deflected away for a corner. Edwin took the corner and it fell to Dhanpal Ganesh in the box who was left criminally unmarked. The tall midfielder glanced the ball into the far corner and ran off to celebrate with his new coach, leaving Kashyap shell-shocked. But the pace of the game died down soon after. Though Anderson had a goal ruled out for offside soon after, it was Chennai City who were playing well. But they could not force another goal before halftime. Santhosh Kashyap’s men started the second half well and seemed intent on finding a winner, evidenced by Kashyap’s decision to make all his three substitutions by the hour mark. Chennai winger Edwin had a good chance to give his side the lead in the 59 th minute when the effusive Charles slipped him through on goal but his shot lacked power and direction. However, the Brazilian showed Edwin how it is done, ten minutes later. After chesting down an innocuous pass with his back to the goal, the Brazilian flicked it over his head, fooling Djelaludin and raced past Wadoo and Kattimani to tap the ball in to send the Chennai bench into raptures. A shell-shocked Mumbai FC had absolutely no response to the goal and collapsed as the idea of a sixth straight loss began to look real. Mumbai tried to pepper the Chennai penalty box with long balls in the hope that their burly forward Anderson might create something, but Chennai City goalkeeper Shahinlal was not troubled much. An invigorated home team saw the game off as Mumbai ran out of ideas and eventually the home team notched vital three points that saw them leapfrog the Yellow Brigade to the seventh spot with as many points. Mumbai FC’s morale, on the other hand, would have hit rock-bottom after suffering a sixth straight loss.